I’ve started to jog to work in just my suit – no overcoat. It’s a great feeling, letting the crisp spring air blow through my hair, smiling at the people who think I’m weird for running in a suit… But the best part of spring is the flowers! The cherry blossoms seem to steal the stage, but my absolute favorites are apple blossoms, and even more: Magnolias! Wow, the way a Magnolia just explodes in pinks and purples is amazing! I always enjoy when the season changes because I get to see the Magnolias. One of the less-sung flowers of the season, similar to the apple-blossom that I so enjoy, is the Strawberry flower. It’s a lovely, delicate little flower that anyone who grew up in the country is well familiar with. Wild strawberries are one of the things that I used to most look forward to in the spring! They’re tiny, smaller than blueberries, and SO flavorful! Well, today’s meal is just a bit of Spring – bringing the flavors of the season in with my breakfast food! The salad itself is a fairly simple meal. We’ve done this before, right? So instead of talking about the salad, I’ll talk about why Strawberries, Lime, and Olive Oil mix so well, and why Apples and Carrots really round out the meal. And, of course, why I chose NOT to use avocado, which is nearly a staple in any meal for me! There’s something magical about the first couple of Strawberry harvests in the spring. Of course, with the global food market, I have access to strawberries year-round, but they’re simply not the same thing as they are right here, right now. Local, organic strawberries, first harvest. It’s just great! Yes, these are greenhouse strawberries, but it’s still too soon to get outdoor strawberries in NYC; at least local ones. One of the things that I love the most about strawberries is that when you cut them open, they start to “bead up” with their juices. Unlike plenty of other fruits and berries, where once the skin is off, all the juice just drains right out, strawberries “seep” their juice out slowly. This is great for salads because it doesn’t contribute to the overall liquid/moisture content of the dressing much, but it will still be a juicy flavorful treat! Now, combining strawberries with lime juice, and you have a little bit of a catalyst to pull the moisture out of the strawberries. The same can be done with pure sugar, which we all know from making Strawberry Shortcake at some point in our lives. Lime does the same thing, which will allow the flavor of the strawberries to contribute to the salad more, almost like a vinaigrette! It’s delicious! And finally, the olive oil. Here’s the tricky part: I add the strawberries, squeeze the lime over them, and let them sit for a while, drawing the flavor out of the strawberry. 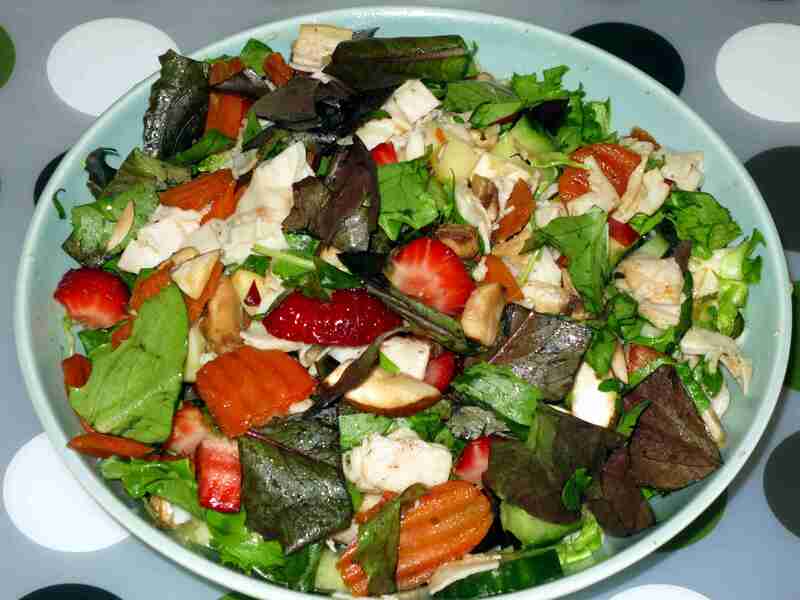 The olive oil, however, will encourage the strawberry to hold on to it’s juices, so it’s a careful balancing act with regards to how long you’re willing to wait to put the oil in the salad… The sooner you do, the less flavor the lime juice will be able to draw out of the strawberries! How many of you will actually use an in-kitchen Smoked Meat recipe? If you will – which meat would you prefer to see first: Beef, Pork, or Chicken? I can’t wait to hear what you all have to say – make sure to hit the comment boards with your responses to the comments above! lol I absolutely LOVE your spirit! Jogging in a suit! You should start a movement! You could do like a dirty girl or warrior run but all people in their suits w/brief cases! <3 it! I just might try this salad. I'm not a huge fan of salad, although I have never tried putting all of these different things in it! Thanks Sherry! The strange looks I get definitely make it worth my while. And I love the idea of a suit run – though I’m not sure I want to ruin any of mine! The salad was amazing! Being healthy (no matter what diet you subscribe to) has to include eating a lot of green leafy veggies – so finding ways to keep that exciting is an endlessly interesting challenge for me! I hope you like the salad!